While incarcerated, felons’ health care is provided by the Bureau of Prisons (BOP), which oversees the custody and care of over 195,000 persons currently serving sentences for crimes committed. Even if felons have insurance coverage through a regular health care plan, those policies are not active during incarceration. Coverage resumes upon release from prison even when going to a halfway house or home confinement. All felons on probation can use their health insurance coverage. 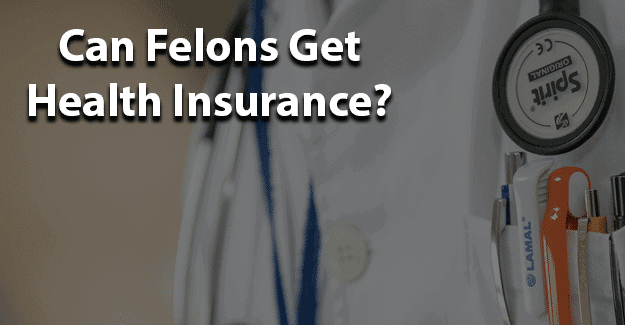 This blog post will cover whether felons can get health insurance. Most felons who are in prison have no health insurance. For many of those incarcerated annually, they have had little or no previous access to health care. This makes the medical care they receive under the B.O.P. far better than they have previously had. Before they were incarcerated, many had no job or lost their job while legal proceedings were going on. This left them with no coverage. So, when they are released from prison, they are still in the same position. The most logical way for them to get health insurance after their release is to get a job that offers these benefits. Haven’t they heard that finding a job is almost impossible? Felons can’t take that attitude, or they won’t find a job. They have to be positive and persist in finding employment. Those opportunities exist, if they are willing to seek them out, even if it takes a while. There are employers who will hire felons. But they must give themselves the best chance possible. To help, get the free guide to getting a job. For many there is education and training available to make getting a job easier. They can help themselves by showing their skills in the best possible light by seeking assistance with their resume. So, that would take care of health insurance for those who can find a job. How about those who can’t get employment or for whom it takes months of job searching? Well, there is a health insurance alternative. With the passing of the Affordable Healthcare Act (ACA), those previously uninsured adult citizens are now required to have health care coverage. This plan is typically called Obamacare. As an important part of the ACA, there has been an expansion of the Medicaid program, which is the federal-state health insurance for those with limited or no income. Under federal law, states must provide Medicaid to children, pregnant women, and disabled adults. Expansion of this program for those 25 states that elected to expand, they must now provide coverage to all non-elderly, low-income adults. This has allowed almost five million felons on parole or probation to become eligible for this program. Many of the 650,000 released from prison each year are eligible for Medicaid. That is the reason for signing felons up for Medicaid while still confined, so they may have coverage from the date of their release. There is a substantially higher rate of chronic diseases among prison inmates than in the general population. Few of those affected have any health care coverage. Felons generally are in worse health with more chronic and infectious diseases than non-felons and have a higher mortality rate. Having healthcare through traditional health insurance or Obamacare will not only impacts felons’ health status but also reduces risk of infections from Hepatitis, HIV, and tuberculosis, which have a high prevalence in prisons, from being carried into communities following felons’ release from prison. With more limited employment options already, dealing with a chronic illness can prevent some of those from getting or holding a job. Better health can help them get and keep a job. With the prevalence of chronic diseases, infections, addiction, and mental health issues, having access to treatment can help prevent a return to their criminal ways and future return to prison. Health care, including addiction and mental health treatment programs, has been shown to keep felons from going back to prison. It is important to have the ability to get proper medical care, especially for felons dealing with serious physical diseases and chronic conditions. Getting out of prison and finding a job presents enough challenges without the extra ones that come with medical issues. Having health insurance is essential. Stick by loved ones after their release from prison and support them in finding a job that offers health insurance. While they are looking for a job, they can sign up for healthcare through Obamacare. For families, encourage them to apply for Obamacare, beginning before they leave prison, if they are still incarcerated. Having health insurance will help make their transition back into society easier, make them healthier, and extend their lives through proper medical care. What do you think about this blog post? Are you or someone you know a felon in need of health insurance? What has that been like and were they able to get health insurance? Please tell us in the comments below. My son has been told that he doesn’t qualify for medicaid, because he doesn’t have any children. He is practicing celibacy/purity until marriage. He is working currently at a temp agency, thus not having the option to apply for any medical, dental, & vision insurance. Are you aware of companies that are hiring people that have a felony, and offering full time positions, with medical, vision, & dental insurance coverage?